The Greater Manassas Saint Patrick’s Day Parade Committee is grateful to have the following pipe bands and Irish dancers as a part of our parade. We hope you’ll join us on Saturday, March 9 to enjoy the traditional Irish flair that makes our event unique. In addition to these groups, a host of other local businesses, civic groups and organizations will also march in our parade. The Boyle School of Irish Dance is a local organization that offers Irish dance classes throughout the area. The mission of the Boyle School of Irish Dance is to enrich the lives of children and families through the rich culture and heritage of Irish Dance. We strive to help our students grow into strong, confident, kind adults through the experiences they will have while dancing with our school. The Boyle School strives to offer an environment for all dancers to exercise and share their talents with the community whether through performance, competition or simply for the joy of dancing. 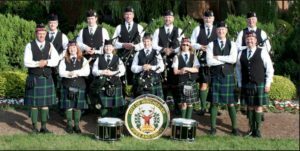 The City of Alexandria Pipes and Drums is a EUSPBA-Sanctioned Grade 4 pipe band based in Alexandria, Virginia. We play a prominent role in parades, festivals and special events throughout the greater Washington, D.C. area. Combining precision marching with innovative musical arrangements, the band has been delighting audiences for over four decades. The band has performed at the White House, foreign embassies, a gubernatorial inauguration, the President’s Cup golf tournament, rock concerts, university commencement exercises, military ceremonial balls, and many other prestigious events. The Notre Dame Alumni Band of Washington, DC, composed of former ND band members, marches in parades all around the region. 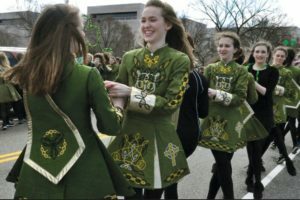 Every year the Greater Manassas Saint Patrick’s Day Parade is pleased to welcome this highly trained group of performers.